Quadra launched their company in 2009 with the idea of creating real, “all-season” expedition grade gear bags, accessories and equipment. Products that would withstand anything the environment, your customers or their machines would throw at them. The result of all the hard work, prototyping, testing and refining are products that will easily withstand rain, snow, mud and dust and never allow the elements to get to your gear. It doesn’t matter whether your customers own an ATV, UTV, Side by Side, Truck, Jeep or Motorcycle, Quadra has created products that will help them get outdoors, and stay outdoors longer, ultimately keeping their gear completely safe from the elements. Introducing the Quadra Bazooka Gear Bag. The Bazooka is very versatile. It has been specifically created to fit on the rack of ATV’s, in the bed of UTV’s, or the rear cargo area of Jeeps and other off-road vehicles. 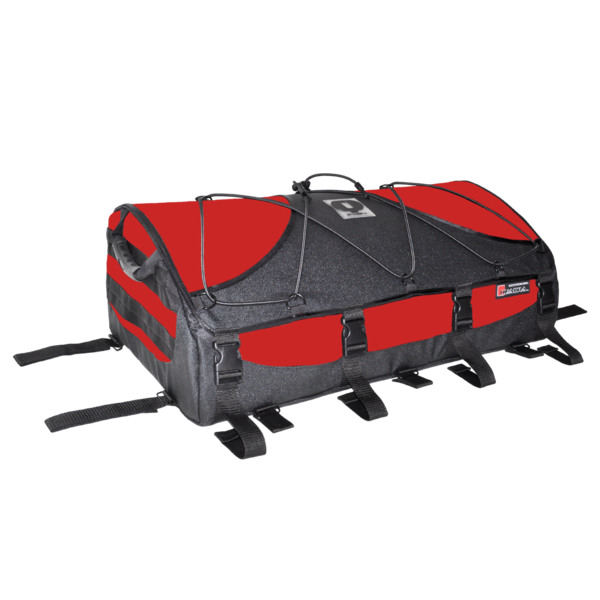 This bag was designed from the ground up to truly be a 4-Season Expedition grade gear bag system. Rain, Snow, Mud and Dust are no match for this bag thanks to the engineering and technology built into the bag. Are there any Facebook shoppers out there? I know there are many folks who like to take pictures of their cats or their food and share it with all of their “friends” on Facebook. But I have an even better idea. It seems that there is always an event that requires a gift. Every year somebody gets married, buys a house or has a birthday or anniversary. These events require a gift but you don’t always know what to get them. So you go to a Facebook store like mine, Lorsey.com – Rugged Outdoor Wear and More, find the product or gift you “like” and share. How easy is that? The great thing about our store is that you can check out on the spot. Your friends can’t go wrong by buying the gift you like and we can even ship it to their door for you. If you want options in a riding jacket this is for you. The Kakadu High Country long rider coat can be worn three ways. First as a full length coat, second as a 3/4 length jacket and third a coveralls. Kakadu’s heavyweight canvas oilskin jackets are not only waterproof and windproof but they have excellent breathability. Whether you are in the saddle on a trail with your favorite horse or out on a “out-of-season” ride on your motorcycle, the versatile Kakadu High Country Long Rider will work for you. You can count on the qualityKakadu clothingfrom Kakadu Traders Australia. Oh no! Gear overboard! Now what? Has this ever happened to you? You’re kayaking or sailing about on your favorite river or harbor and all you want to do is take a few nice pictures of the coastline, views you can’t see from anywhere else. You grab your digital camera out of your backpack, lose your balance just for a second and then drop your expensive camera into the water. Aquapac has 100% waterproof casesfor all of your expensive electronics including PDA’s, camcorders and SLR cameras. Never worry about your expensive gear getting soaking wet again. If you are looking for rugged outdoor apparelor a nice work jacket you can’t go wrong with Dri Duck work wear. Dri Duck was formed in 2003 in Overland Park KS. Their unique designs combining innovative fabrics and styles create a superior quality product. I’m a fan of the Dri Duck Storm jacket. It’s perfect for doing your outside chores in the winter months. The Storm jacket is fully waterproof and breathable made with the 12 oz cotton canvas boulder cloth. It evens has a teflon coating to keep stains from sticking ensuring a nice looking jacket for years to come. NEW! Aquapac for the iPad! You’re at the beach or pool side. You don’t want to be without your iPad but you don’t want it to get ruined by the water and sand either. The Aquapac iPad 100% waterproof case comes with a 3.5mm nickel-plated headphone socket, LENZFLEX™ optically-clear front and back windows, provides access to both cameras and is airtight. The Multi-Touch screen on iPad works normally through the case. Wi-Fi and 3G work normally through the case. The seams are high-frequency welded to form a super-strong bond.At Lorsey.com are now taking pre-orders for this item. Now you can turn any camera into a waterproof camera with Aquapac. Cameras with zoom lenses…no problem. Small flip cameras…no problem. Aquapac has the waterproof case for just about every application you can imagine or need. Now you can take your camera anytime you go kayaking, fishing or scuba diving and not have to worry about water damage t your expensive photo equipment. You may not know this but Aquapac 100% waterproof cases are recognized by the Outdoor Industry Association. Their products come with a five year warranty. Aquapac started their company back in 1983 over in London UK where they still have the head office. Designing high end quality products to protect our favorite electronic devices and cameras is what makes Aquapac tick. There aren’t too many guarantees in life so when one comes along I have to talk about it. Pelican and Hardigg have united to bring the most advanced solution in protective cases. Survival gear needs protection too! You spend a lot of money on your favorite optics and hunting equipment. The last thing you want is for your gear to get ruined during your travel due to weather or rugged terrain. You can pack so much in these cases and with the variety of cubed foam layouts you can customize the case yourself. Everytime we get more snow the winter just keeps getting longer. Oh it could warm up soon, just not soon enough. One thing for sure is that when it does decide to start melting around here, we are going to be knees and ankles deep in mud. Yes, spring in Maine is known as “Mud Season”. It’s not really the time to year your best shoes. You’ll want to carry those with you and then put them on when you get inside where you are going. Muck Boots is what I’m talking ’bout. Wear them with confidence knowing you can hose them down when summer comes in June.